If you never peeked into other worlds with a View Master, you missed a magical experience. Those who enjoyed such an experience know the thrill of transporting to mysterious places and the infinite fun of playtime. The resurgence of retro gaming systems provide a similar joy. The video game world advances in technology but fans still love the retro feel and look of original games. Rather than viewing the games and systems as outdated or hackneyed, they feel nostalgic and fresh. They maintain their authenticity. Not only do these games take players back to their own childhoods, they re-ignite the wonder and excitement felt when we first played them. In a world that strains forward to the newest or latest thing, we find ourselves looking through jaded eyes. We are never satisfied with the lightening fast advancements of technology and we find fresh wonder in what came before. Take one step forward and two steps back from the endless cycle of of changing technology to discover vintage cool. We have an ever-changing array of technology to choose from in our stores, both newer and vintage items. Retrogaming, also known as classic gaming or old school gaming, has a large fan base in Arizona. Bookmans is the perfect place to find retrogaming gear. The Atari Flashback Classic Game Console has 20 Atari games built in, two Atari 7800 inspired joysticks and a retro style game console. The original Atari is difficult to find in working condition. This is a slimmer more convenient design. There is no need to search for games or controllers. The set up is simple–turn on and play. It comes with a library of games that are all retro Atari. The Tetris and Namco Plug ‘n Plays are hard to find. They have the original graphics plus all of the equipment is in one unit for easier set up. The Plug ‘n Plays also have the best retro games like Pac-Man and Centipede. Asciiware Super Advantage is a Super Nintendo joystick controller pad. This system has some of the first fighting games like Street Fighter. The system allows for easier to execute combo attack moves. Die hard collectors often seek players guides to Super Mario World 2, Yoshi’s Island and Donkey Kong Country 2 Diddy’s Kong Quest. 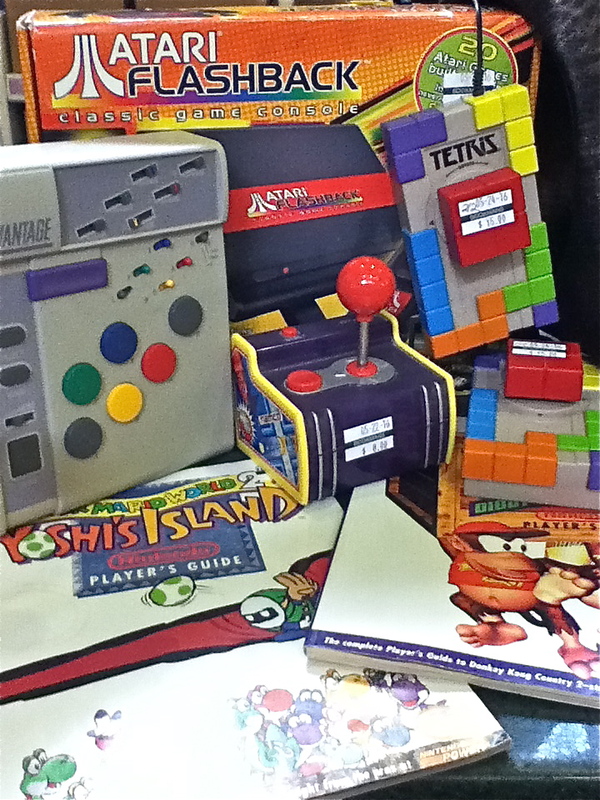 These guides are for those who want the original copies of vintage Nintendo players guides. If you are a true gaming geek let us know what you think of retro gaming. For a closer look at some of the finer points and history of retro gaming check out the Did You Know Guys videos like this one on Mario Power. For a non-G-rated look at classic gaming check out the Angry Video Game Nerd or Game Grumps for a hands-on take on retrogaming. * Bookmans is your store to explore. At the time writing, we had every item mentioned in this post available for purchase. Unfortunately, we cannot guarantee stock. If you are looking for a specific item, give us a call and we’ll check our shelves for you. If you are serious about your retrogaming collection, the best advice we have for you is to come hang out with us. We refresh our video game stock every day.